As the name suggests, Indian head massage involves the use of various massage techniques to relieve tension and musculo-sketetal problems not only in the head, but also the upper back, shoulders, neck and face. Tension can all too often build up in upper body, due to various reasons such as bad posture and stress, leaving one feeling tired, agitated and generally run down. 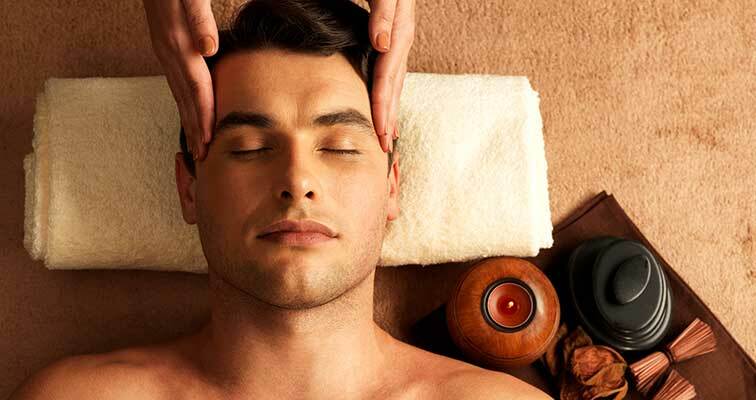 A full treatment of Indian head massage, usually lasting between 50-60 minutes, can help to release this built up tension, leaving one feeling refreshed, relaxed and calm, aiding sleep and promoting a sense of well being. It can also help to bring about a more positive outlook on life by helping to relieve everyday stress and anxiety. Indian head massage does not have to require the removal of clothing, and is usually done with the client sitting on a chair. It is ideal for those who sit at desks all day, and can provide instant relief from stress. Massage has always played an important role in Indian life. For thousands of years, massage has been used to heal and soothe the sick, often being the principle means of healing and relieving pain. It is common for infants to receive massage a few times a week, to help them to keep in good health, physically and emotionally. The use of massage is part of the ancient Indian health science known as Ayurveda. It is still common today to see massage being performed on the beach, at markets and on the street corner. Indian head massage, or ‘champissage’ as it is known in India, is a tradition developed by women, that has been past down through the family from mother to daughter, using different oils such as coconut, sesame and almond, to keep their hair in beautiful and lustrous condition. It is also practiced by barbers and masseurs to provide an invigorating scalp massage designed to stimulate and refresh the client, rather than just as a beauty treatment. Alison really takes the time to make sure the Indian head massage isn’t rushed and you come out feeling completely relaxed. I have a lot of tension around my neck area and Alison could immediately tell that this was the area that mostly needed work, she doesn’t stick to a set routine, she does what works for your needs. I would definitely recommend!